We will be providing the opportunity for people to remotely attend the CHI conference via live streaming and telepresence technologies. Our goal is to increase access to the conference for remote participants who would otherwise be unable to attend due to mobility impairments, chronic health issues, or temporary travel limitations. For the technical program content, the main way for people to remotely attend CHI is through the live streaming of talks. Most papers sessions will be live-streamed. 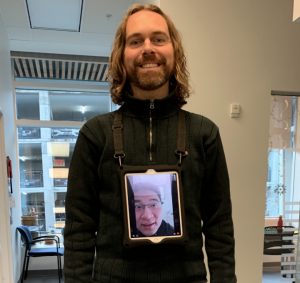 To support social engagement at CHI, ‘local buddies’ present at CHI or ‘human proxies’ can bring you into the conference remotely through a tablet and video conferencing software that can be either either worn or carried. This will allow people to meet up with others to socialize. The image below shows an example setup. A local buddy, either a colleague or another attendee at CHI in person, will have a tablet and connect to the remote attendee via Skype. The tablet can be hung around one’s neck or carried in hand, depending on what people are comfortable with. Remote attendees will be able to talk with their partner through an earpiece that the local proxy wears. Remote attendees can also talk directly with other attendees at CHI. Together, the remote and local attendee will jointly decide how to participate in CHI. Any local attendee can volunteer to be a remote buddy / proxy. Just contact the telepresence chairs. Volunteer proxies gain the opportunity to network with people and have a shared experience with a remote attendee. We feel that being a local volunteer could be especially valuable for newcomers to CHI such as new grad students who may not know a lot of people and want to network with others. It could also be a great way for a lab group attending the conference to involve one of their colleagues who can’t be there. Overall, buddies/human proxies represent a lightweight way for remote attendees to be present and move throughout the conference venue for meeting other attendees and socializing and for seeing exhibits. For the physically present person, it also presents a fun way to ‘attend’ CHI with another person, also meet new people, and have a joint experience with them. Remote attendees will need to pay $30 USD for each time block that they select. A time block is generally comprised of 2 hours of time. You will be able to select as many time blocks as you like throughout the CHI schedule. Fees will go towards paying for the proxy’s technical setup and WiFi. You do not have to pay any additional CHI registration fees beyond the above costs/registration fees. 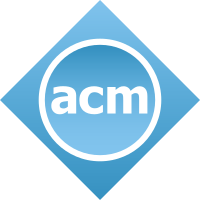 If you would like to be paired with one or more proxies for an entire day during the main conference program, Monday to Friday, you can book a series of time blocks for that day. We do not have a daily rate. If you would like to participate in a workshop via telepresence, please contact the telepresence chairs to discuss the possibility. If you are interested in remotely attending CHI coffee/lunch breaks and the exhibition session by being paired with a human proxy, please complete the application form before February 28, 2019. Letting us know early will help us to better support your needs. For more details around the rationale for introducing CHI buddies/human proxies for remote attendance, you can read about it at this blog post. A research study that explores the idea and highlights its benefits can be found here.